This discussion shows model tests to study the mechanism of shaft resistance of a nodular pile in relation to a stone column. Nodular pile has been widely used as a friction pile and/or as a pile to improve loose ground for more than 60 years in Japan. Fig.1 shows an example of the nodular pile. It is a precast pile with a hollow circular section. 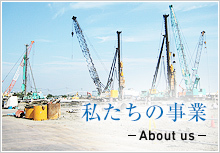 A, nodular pile is made of prestressed high strength concrete. As shown in Fig.2, a nodular pile is usually driven into the ground with gravel around the pile.